Bonsai, pronounced "bone-sigh," is Japanese for "tray" and "plant." 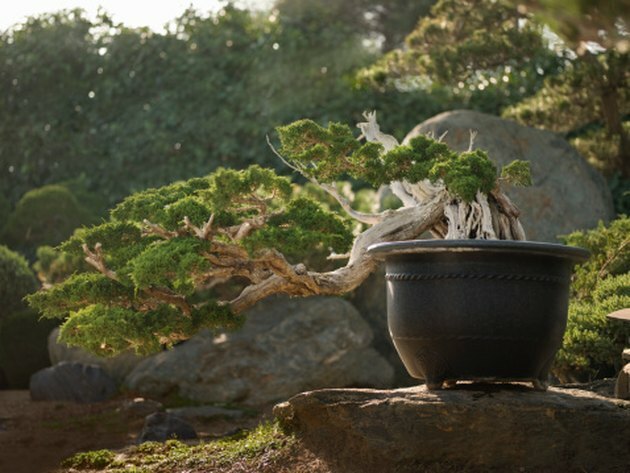 The bonsai originated in Egypt, moved to China during the Jin Dynasty and was brought by monks to Japan, where the technique became an art form and type of mediation. A normal-sized tree -- fichus, myrtle, hibiscus, pines and junipers, as well as other varieties -- is trained through pruning, potting and wiring to be miniature. The oldest bonsai trees are more than 500 years old. Though the age of your bonsai is important, the care, sizing and shape are more important in the art and mediation. Bonsai is more than a gardening technique; it is an art form and a mediation technique. Make note of the history of the bonsai through the nursery or individual where purchased and keep track of the amount of time you have owned and pruned the bonsai. Observe clues on the tree. The older the tree, the larger the base of the trunk and the more impressive the root structure. The branches also will be more defined in older bonsai, with a well-developed crown. Older trees typically have horizontal branches. Remove an old branch, and count the rings on the branch. This will give you an estimate on the age of the remainder of the tree. Count the rings at the base of the trunk. This is the only completely accurate technique to determine the age of a bonsai, but if your bonsai is alive, this technique obviously is counterproductive. Take a core sample of your bonsai and hire someone to scientifically age it through use of an electron microscope.